What It’s About: Phil (Bill Murray) is a TV weatherman who’s covered the Punxsutawney Groundhog Day celebrations for four years running. Only this time, when the “festivities” are over and he wakes up, it’s still Groundhog Day, and he’s forced to relive the events of the day before. Can Phil figure out how to escape from a time loop when there are no Time Lords or Federation officers in sight? Why Watch it Today? 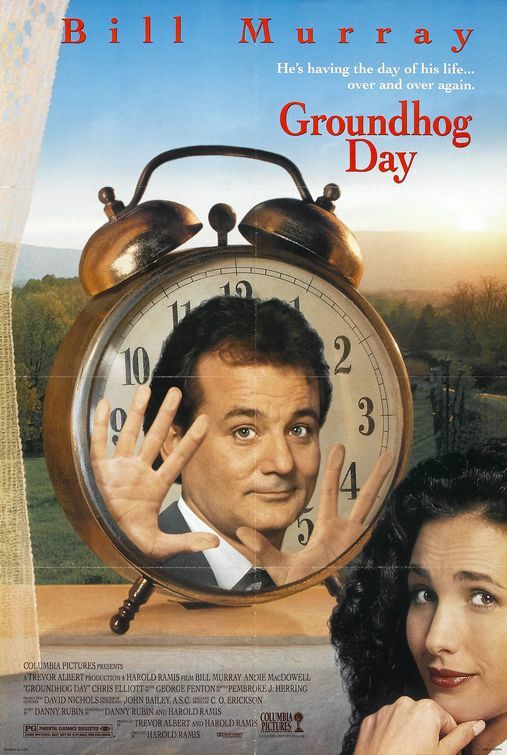 : Groundhog Day is, let’s face it, an obvious Groundhog Day choice-but can you name a better one? Much less a successful Fantasy/Romantic Comedy about time repeating itself? This entry was posted in Black Comedy, Comedy, Fantasy, Movie of the Day, Romance, Slapstick and tagged Andie MacDowell, Bill Murray, Brian Doyle-Murray, Chris Elliot, Columbia Pictures, Groundhog Day, Harold Ramis, it's not over, National Film Registry, PG, Rick Overton, Stephen Tobolowsky.